When I started to design this, I had an idea of a prison that was somehow suspended above ground. It would be virtually impossible to escape from a place like that. As I took the design further I came up with the idea about these mobile units that would be possible to move around with special carrier crafts (in other words, this structure does not move on its own, but it can be moved). I thought it would be cool if these facilities would be placed on craters or sink holes to establish mining operations at the site. 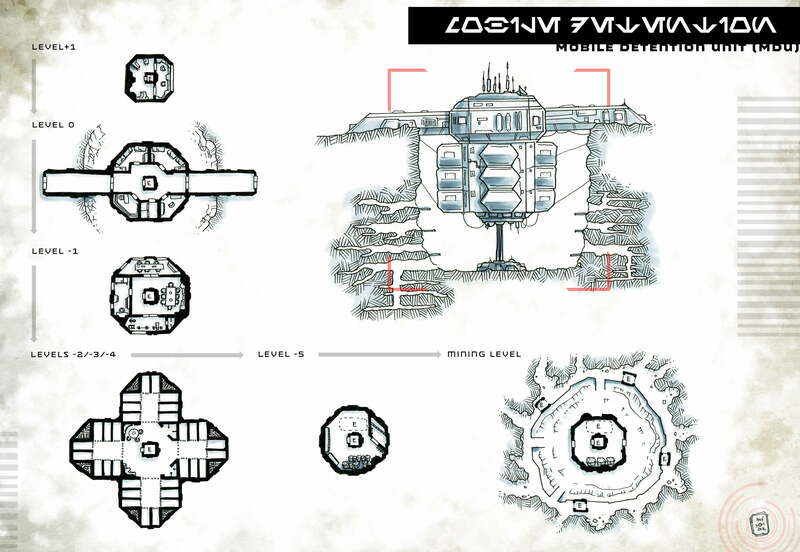 When the resources were harvested, the structure would be moved to another location. Level +1: This is the operations control and communications level. A small command center handles all the stations remote operations and surveillance inside and outside the MDU. Level +0: This is the level that has two entrances that work also as the anchors when the MDU is stationary. This level also has the quarters for the guards and other personnel, a storage room and a room for processing new inmates. Level -1: This level has a meeting room, a mess, a small gym and the warden’s quarters. Level -2 through -4: These are the actual prison levels each with 32 cells divided in 4 separate blocks. Each level has a small day room for recreation and other daily routines. Level -5: This is the access level to the mining site. Here’s a small storage room and possibly pressure suits for the inmates and guards alike if necessary. This level can also act as an airlock. there’s a smaller elevator and a larger cargo elevator which is also used to move the workers between this level and the mining site. The Mining Level: This is where the mining operations are located. There are a few guards on watch always when there are workers on shift, but there are also cameras and automated gun turrets on the bottom of level -5 pointing down to the mining level.